The W108/W109 family was first introduced at the Frankfurt Auto Show in 1965. Throughout its entire production run it was only available as a four door sedan. The models that where introduced where the 250S, 250SE and 300SE from the W108 chassis and the 300SEL from the W109 chassis. The fins were eliminated and the glass line lowered to give the car a much sleeker look. 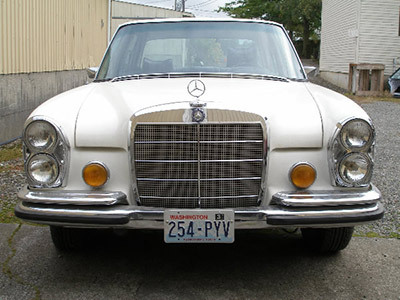 Late in 1967 flagship of the family, the 300SEL 6.3, was introduced. The only outward difference between the 280's (W108) and the 300's (W109) was a more generous use of chrome around the window areas. Inwardly, the furnishings of the 109 where of the finest as befitting this most elegant limousine of the New Generation class. This chassis was only produced in a four door sedan model with the L version being about 4 inches longer (all in the rear door). Only gasoline 6 and 8 cylinder engines were fitted in these models. They are becoming a real enthusiasts car since they maintain that classic Mercedes look (that the design of no other car had at that time) and provide the owner with the performance and handling to stay right with modern traffic today.